By DXS Physics Editor Matthew Francis, who usually brings you Everyday Science. As you will see, this is science of the Not-So-Everyday sort. Perhaps the most important question to ask in science is "how do we know?" While it's appropriate to ask this every day, today it feels even more so, as we prepare to witness a very rare astronomical event. This time, it's happening on June 5, 2012; when this event occurred during the 18th century, it allowed astronomers to make the first precision measurements of the size of our Solar System. Captain James Cook, best known for his exploration of the Pacific (for Europe, that is—the natives already knew what was there), took a set of scientific instruments aboard his ship to Tahiti; other teams of researchers took measurements at those locations. 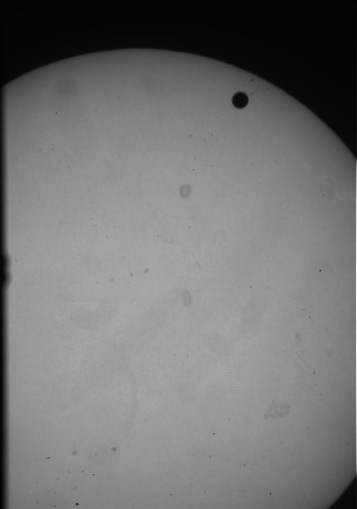 The rare event they observed was the transit of Venus: when Venus travels directly between Earth and the Sun, blocking a tiny amount of light. Astronomers in different locations timed the crossing of Venus across the Sun's disc, and by comparing their numbers, were able to determine the distance between Earth and the Sun. With that distance in hand, they were able to calibrate the size of the entire Solar System. The 1769 observation was an international scientific effort (to use modern language), and while the results weren't as good as the astronomers of the day had hoped, they still agreed with modern measurements. Today we use a variety of techniques to measure distances, including radar ranging (bouncing radio waves off planets and timing the round trip), so we don't have to wait for Venus transits anymore—which is good, since they aren't common! The last Venus transit was in 2004, but the previous one before that was in 1882, and the next one will be in 2117. I got up very early in the morning on June 8, 2004, joining some fellow astronomy enthusiasts at the Rutgers observatory, where we took the photo you see at the top of the post. The seemingly odd intervals between transits are because Earth's and Venus' orbits around the Sun don't lie in the same plane. If you draw Earth's orbit as an ellipse on a sheet of cardboard, and Venus' orbit on another sheet of cardboard, they need to overlap in a small X pattern, as shown in the picture. The only times Venus will transit is when both Earth and Venus are on the same side of the Sun, and only when they are in the region where the cardboard pieces overlap. The angle (3.5°) in the picture is correct, but I've exaggerated the size of the Sun and the sizes of the "transit zones"; in truth, even though the Sun is huge compared to Earth, it's not that big on the sky. If you do the real calculation, you find that Venus transits happen roughly twice per century, and those two events are separated by 8 years. It's a rare and wonderful event! If you want to view the Venus transit, the first thing you should do is see if it will be visible where you live. (Hopefully the weather will cooperate too! Such is the life of an astronomer.) In Richmond, Virginia (where I live), the transit begins around 6 PM. If you're in the area, the Science Museum of Virginia is hosting a free viewing on the lawn; many other cities and towns have similar events. A common sense warning: please don't look directly at the Sun! However, you don't need fancy equipment or a big observatory to witness the transit. 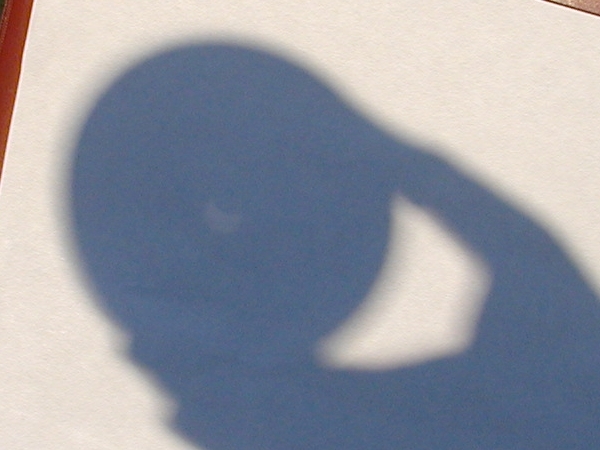 Two weeks ago, I observed the solar eclipse using nothing but a microwave macaroni-and-cheese container. By piercing a hole in the bottom of the tub, I created a simple pinhole camera. A small and kind of fuzzy image of the eclipse appeared on a piece of paper, which I photographed. (Obviously you can do better if you have better equipment—I happened to be far from home during the eclipse and used what I had on hand.) A piece of cardboard covered in aluminum foil with a small hole works better, and you can project the image right onto the sidewalk, the side of a building, or another screen. If you have a pair of binoculars that use glass lenses (since plastic will melt), point the larger lens toward the Sun and the smaller lens onto a flat surface. (Again, don't look through the binoculars if you value your eyeballs!) If you have a telescope with a mirror or glass lenses, you can also project the image onto a flat surface, or create a sun funnel. There are a lot of ways to view the Sun if the ones I mention don't appeal to you. As a word of caution: the Venus transit won't look as impressive as a solar eclipse, since Venus is a lot farther away than the Moon. It will appear to be a small round shadow on the Sun's disc. The thrill (for me at least) lies in the knowledge: you are viewing a planet not much smaller than Earth as it crosses between us and our home star! If it isn't enough these events are rare, think of how significant it is to catch a glimpse of the sheer size of our Solar System, in a way we don't usually get to see. And always, always remember to ask the question: "how do we know?" Nicole the Noisy Astronomer has some details about her adventures making a sun funnel, along with some other tasty transit bits. Summer Ash shares how the Venus transit reveals the distance between Earth and the Sun, and includes some additional viewing tips. The Hubble Space Telescope will be using the Venus transit, not for what it teaches us about our Solar System, but to help the search for planets orbiting other stars, known as exoplanets. Mark Anderson has the scoop. I wrote an essay last year with a lot more about how the Kepler telescope uses transits of exoplanets to hunt for other worlds. While it doesn't mention Venus specifically, the ideas are the same!